Canney was a broadcaster, writer and teacher as well as an artist. From an early age he was influenced by some of the leading artists of the age (including de Chirico, Nicholson, Hepworth, Bacon and Rothko amongst others). 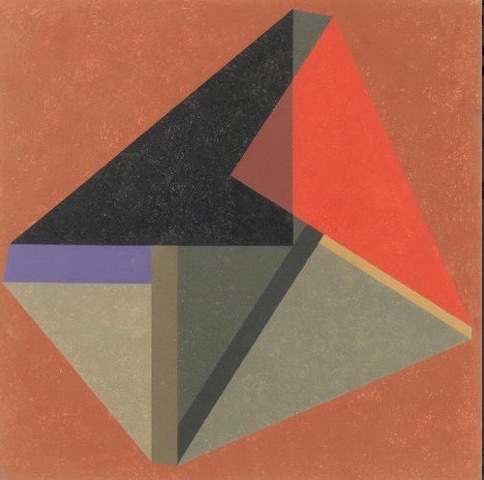 He worked in oil and Alkyd oil (which had a fundamental effect on his work) as well as in gouache and his work – mainly geometrical – has beautiful colour and balance. This present work dates from the 1980s. It can be compared to that which appears in the frontispiece of the Catalogue to the 2007 exhibition of Canney’s work put on by Liss Fine Art, Robert Miller and the Fine Art Society.